Happy Thursday, readers! 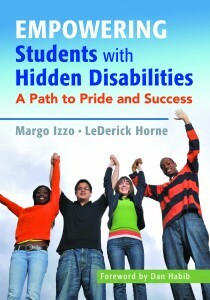 Today we’re very fortunate to have two special guests on the blog: Margo Vreeburg Izzo and LeDerick Horne, co-authors of the great new book Empowering Students with Hidden Disabilities. They’re here to talk about how to support students whose disabilities aren’t always visually evident–and how to guide these students on the path to disability pride. Q. Your book is about empowering students with hidden disabilities to reach their full potential in school and life. For people who might not be familiar with the term “hidden disabilities,” can you provide a definition and a few examples of what types of disability that term encompasses? MVI: Students with hidden disabilities cut across a number of disability categories. Although the majority of students with hidden disabilities are labeled with some form of learning disability, speech/language disorder, or ADHD, students with hidden disabilities can also include those with mild visual impairments, behavioral disorders, or autism spectrum disorder (ASD). What all people with hidden disabilities share is that they can, in some environments, be perceived by the outside world as being “normal.” They lack those visual indicators that shout “DISABILITY”: the signs that easily conform to society’s perception of disability, like using a wheelchair, walking with an impaired gait, or speaking with an obvious impediment. 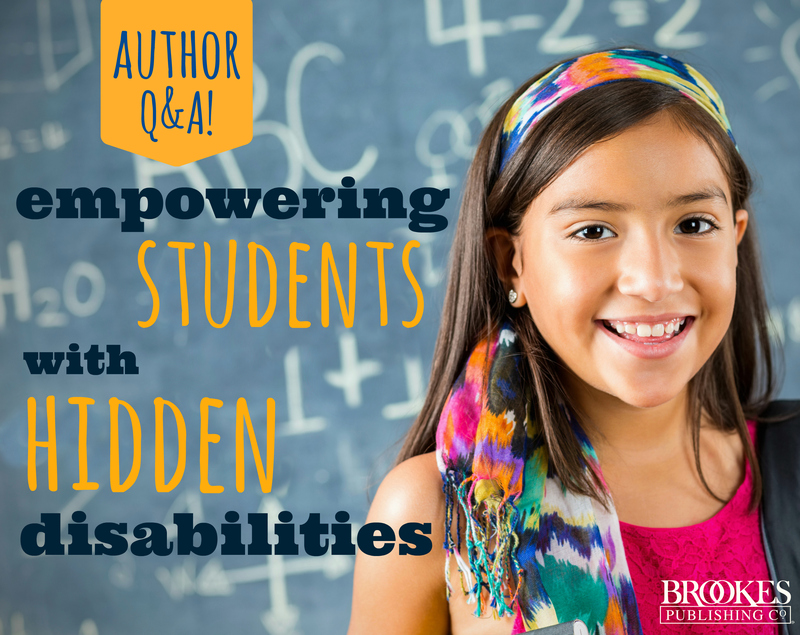 Having a hidden disability gives students the option to either hide or disclose. They have the “choice” to deny this aspect of who they are or incorporate disability into their identity. For example, I have ADHD. My friends and co-workers cannot see that I have ADHD. But if they observe me working, they may see that I am easily distracted and disorganized. Once I acknowledge that I have ADHD and need to manage these characteristics, I am more likely to obtain the support and accommodations that I need. However, if I deny that I have a hidden disability, do not use accommodations or supports to help me manage my responsibilities, and continually miss deadlines or produce poor quality work, I will not reach my full potential. The first step to becoming empowered is to embrace your disability by accepting your strengths and your limitations. Then we must work around our limitations by using accommodations or supports to accomplish our goals. Q. Both of you have personal experience with hidden disability. How did your respective experiences motivate you to write this book and bring you two together as an author team? LH: After I graduated from college with a BA in mathematics, I started sharing with people my personal story of growing up with a learning disability. I have used spoken word poetry as a tool to communicate the emotional demotion of what it means to have a disability in our schools and the larger society. And I also have worked with groups on the national, state, and local level to improve the lives of people with all kinds of disabilities. Speaking, performing poetry, and collaborating with different organizations around transition and youth leadership has been very meaningful, but I always wanted to create a book that captured the supports I know helped me to be successful as well as the resources I have seen others use to reach their own level of success. Margo and I met a few years ago, and I was immediately blown away by her own experience of having a hidden disability as well as the awesome work she has been doing to improve the outcomes of people with disabilities. We developed a friendship and she was the first one to suggest we collaborate on a writing project. I believe in the Disability Rights Movement’s idea that there should be “nothing about us without us.” So being able to combine Margo’s abilities as a researcher and my abilities as a storyteller into a book seemed like an ideal opportunity. Q. In your book, you introduce a “Disability Pride Framework” that shows two pathways: one related to disability shame and the other leading to disability pride. What are some concrete steps educators can take to start their students with hidden disabilities on the path to disability pride? LH and MVI: We created the Path to Disability Pride to help self-advocates–and the educators and families who support them–develop and maintain a positive self-image related to their identity as people with disabilities. There are a number of stages but the one we think is most critical is “Awareness.” There are far too many people with disabilities, particularly those with hidden disabilities, who are not told their disability label–or, more importantly, what it means to have a specific hidden disability. This is a very important piece of information if you are going to grow up to be a self-advocate who does not feel shame related to the way your mind or body works. After reviewing the framework, one concrete step that we hope families and educators take is to make sure every student is aware of their disability. We want students to understand their assets and their challenges. In addition, we hope that students gain successful role models with similar types of disabilities, whether it be an athlete, actor, or teacher in the school. Students need to realize that their disability will NOT prevent them from being successful. However, disability shame may lead to behaviors that compromise their potential. Educators and families might think they are protecting a young person by withholding information about their disability, but we encourage those providing supports to give students an asset-based understanding of their disability. This approach begins with explaining all the gifts and talents a student possesses, and then explaining the challenges associated with the way they experience disability. Many people who do not fit into the box of “normality” go on to do amazing things with their extraordinary abilities. And today, many people are not just admitting to having a hidden disability, they are openly proud of their disability and the insights and innovations their “challenges” have inspired. We are challenging educators and people with disabilities directly, to embrace disability as a positive identifier. If students with disabilities are supported and nurtured by their family, doctors, and teachers, they will develop disability pride and connect to a long history and a diverse community of people who share their challenges and triumphs. Instead of feeling shame and exerting energy to hide their disability and pass as normal, students should be empowered to feel proud of how their minds and bodies work. Q. You discuss student-directed IEP meetings as an important way to help students discover their strengths and needs and plan their transition to adult life. At the Inclusion Lab, we’re also strong advocates of self-directed IEPs! What do you think are the biggest obstacles to students taking a lead role in their IEP planning, and what first steps can schools take to implement self-directed IEP meetings? LH: The IEP meeting might be the greatest missed opportunity to prepare students for successful transition to life after high school. Unfortunately, this process has focused more on compliance and less on empowerment. The biggest obstacle to students taking the lead in their IEP is training. It is unrealistic to think that students will be able to take a leadership role within their meetings unless they are put through a program that helps them understand the purpose of the meeting and document. Students also need to take time to understand their disability is as well as their gifts and interest in order to have a meaningful voice within their IEP. A great first step schools can take is to identify a student-directed IEP model to adopt. In our book, Empowering Students with Hidden Disabilities, we direct people to the work of The University of Oklahoma’s Zarrow Center for Learning Enrichment. The Zarrow Center has a number of self-determination curriculum and lesson packages, including a very well-researched tool called the “Self-Directed IEP.” But there are many other programs that I have seen used by state teams, non-profits, and local schools. Q. Social skills are such a critical part of success in school and life. How can teachers support the social-emotional learning of students with hidden disabilities and help them form quality relationships with their peers and others? MVI: Many students with hidden disabilities have difficulty learning verbal and nonverbal social and communication skills. Sometimes poor social skills cause these students to have difficulty working with others. They are sometimes bullied, further impairing their educational and emotional growth. Teachers must ensure that their students gain the skills needed for success in the classroom and in life–and that includes social skills. Take a class period while the students are working on an assignment, and meet with each student individually to build a more positive working relationship and provide feedback on their behavior. Demonstrate that you sincerely care about each student learning both the course content and the appropriate social skills to get along with peers. Discuss how the two of you can work together to help the student avoid the use of poor social skills. Assure each student that you will never embarrass him/her in front of peers. “¢ Teach social skills directly as soon as possible, ideally during early elementary school. Use class jobs to reinforce employability skills such as responsibility and self-regulation. “¢ Share positive role models of other adults with hidden disabilities to promote disability pride. “¢ Teach students how to practice resilience. Demonstrate resilience when you make mistakes and model resilient behaviors yourself. “¢ Use social stories to describe the link between behaviors and consequences and discuss how students are in control of the choices they make. “¢ Model appropriate social skills and identify good examples of social skills when modeled by others. “¢ Role play both appropriate and inappropriate social skills and discuss how poor social skills detract from a productive class climate. “¢ Post rules and other positive behavior support strategies in the class and provide visual and verbal prompts when students deviate from what is acceptable. Q. Preparing students with disabilities for college and careers is another big theme in your book. What are some ways that educators can help students pinpoint their passions and start preparing for life beyond the classroom? MVI: Helping students discover their career interests is an important goal of our educational system and can transform a person from working in an entry-level job to thriving in a prosperous career. Teachers can connect the academic content they are teaching to examples of how these skills are used by professionals and skilled workers. Teachers can engage students in transition planning activities where they explore careers that may be a good match for their interests, abilities, and needs. “¢ Have students complete interest and personality assessments and career projects. Ask students to write about their interests, likes, and dislikes at the beginning of the year. Then connect course content and assignments to their career preferences whenever possible. “¢ Coordinate a Career Day for the class (or school). Ask students to develop a presentation about their ideal career and why they think this career is a good match for their interests, strengths, and other personality or learning styles. “¢ Ask students to research what education and training certificates or degrees they will need to reach their career goal. Then have them research programs that offer the education they need. Ask them to compare and contrast two programs on cost, length of program, and availability of disability support services. 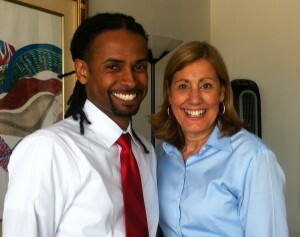 Thanks to Margo and LeDerick for being with us today and sharing their personal and professional insights with us. I’ve had the pleasure of reading their excellent book, and I know it’s going to help so many students (and the teachers and parents who support them). If you want a sneak peek at the early reviews and the table of contents for Empowering Students with Hidden Disabilities, check out the book here. I’ve been trying to find words to help get my point of view across and this will help continue to direct me. I am the author to My Little Red Wagon and Owner and Creator of My Little Red Wagon Garden Kit. An educational hands on learning tool kit that promotes and supports literacy. Just launched April 1, 2016. I have a learning disability of reading and writing and now that I read… Socializing.. I am searching for more information to share and get across ti students and adults. I represent literacy and have just started my new journey on trying to get my message through about learning disabilities and how we can over come them… I would love to read more on what you have… And perhaps maybe you can help me promote it more… Thank you so much. It is a very interesting subject since I believe a lot of geniuses come from some kind of disability. I look forward to hearing back from someone on this. Check out my story on littleredwagongardenkit.com.. I’m not getting the calls in to share my story to others, or schools yet and I’m wondering why…it’s discouraging… Since I have such passion for it. Maybe you are who I’ve been looking for to help direct me in teaching more about this subject. Thanks so much for your comment! I’m the editor of the Brookes Inclusion Lab, and I will contact you directly with a reply.